1 photograph : b&w ; 14 x 16 in. Item is a composite photograph of the Dalhousie University Arts and Science faculty and class of 1907. 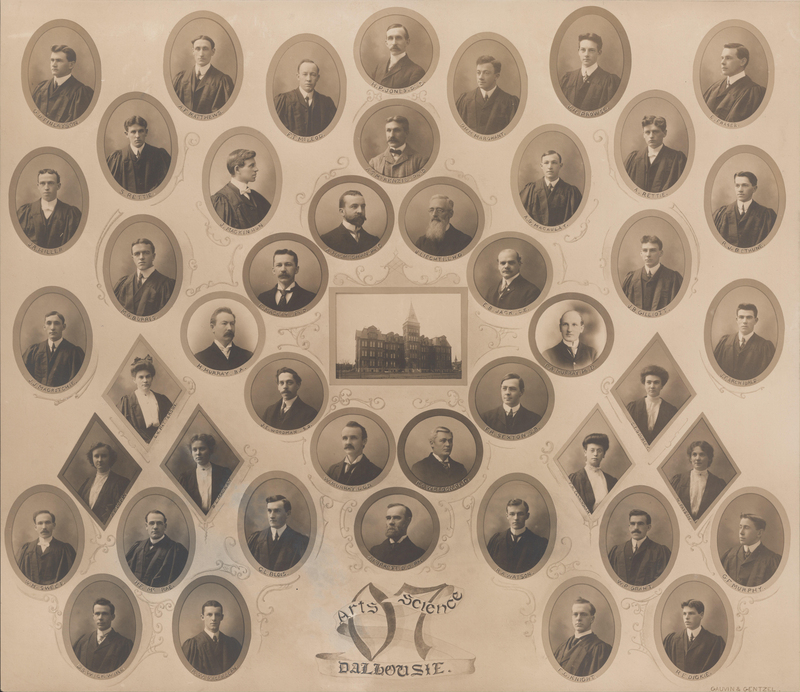 The photograph consists of portraits of J. Forrest; R. C. Weldon; W. Murray; J. E. Woodman; H. Murray; E. MacKay; A. MacMechan; J. Liechti; E. B. Jack; D. A. Murray; F. H. Sexton; R. A Watson; F. G. Knight; R. E. Dickie; W. P. Grant; G. F. Murphy; M. Payson; F. M. Cunningham; C. I. Gourley; J. T. Archibald; J. B. Gilliott; R. J. Bethune; A. Rettie; A. G. Macaulay; E. Fraser; J. H. Prowse; A. S. McKenzie; H. P. Jones; F. T. McLeod; A. F. Matthews; G. D. Finlayson; S. Rettie; J. MacKinnon; J. R. Miller; M. G. Burris; J. J. Macritchie; C. H. Patterson; M. E. Kerr; W. H. Sweet; H. F. McRae; B. L. Mackay; C. L. Blois; R. W. Maclellan; and D. S. Wickwire arranged in several rows around a photograph of the Forrest Building.